A test subject at an Imperial research facility, Aliasse was brought to Gallia by Clementia Förster following the latter's defection. 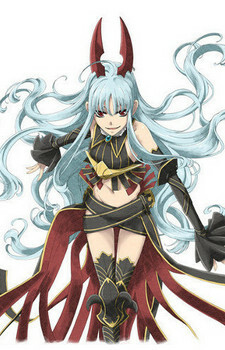 There, Clementia used Aliasse to gain a better understanding of how the Valkyria were able to manipulate energy using ragnite and how to duplicate this power in regular humans. Aliasse considered Clementia a mother figure and was always eager to please her, employing her talents to great effect on the battlefield to provide Clementia with more data without actually understanding the ramifications of her actions. After encountering Avan Hardins and other Lanseal students, Aliasse began to question her place in life and the proper use of her powers. She quickly became friends with the students of Class G and developed an interest in horticulture after planting some flowers with Cosette Coalhearth. These changes however greatly displeased Clementia, who regarded Aliasse's developing empathy as a weakness. After the GRA raid on Lanseal, Clementia attempted to force Aliasse to leave with her. When the young girl refused, Clementia pulled a gun on her and demanded her obedience. Avan and Cosette shielded Aliasse, with Avan drawing his sidearm and threatening Clementia back. Defeated, Clementia withdrew, abandoning Aliasse and ignoring the girl's pleas for understanding. After Clementia's departure, Aliasse enrolled as a member of Glass G and adopted a much more daring rendition of the school's summer uniform. She continued to develop under the care of Glass G and was instrumental in defeating the rebel V2's guarding the Anthold harbor when she took up her Valkyrian arms once more. While her actions ultimately resulted in the death of Leon Hardins, Aliasse was assured by Avan that she had freed his brother and had done the right thing. Following the war, Aliasse enrolled in a horticultural school and moved in with Cossette.